Produktinformationen "Rat IgM, whole molecule"
Rat IgM whole molecule was prepared from normal serum by a multi-step process which includes delipidation, selective precipitation and tandem molecular sieve chromatography followed by extensive dialysis against the buffer stated above. Rat IgM whole molecule assayed by immunoelectrophoresis resulted in a single precipitin arc against anti-Rat Serum and anti-Rat IgM (µ chain specific). No reaction was observed against anti-Rat IgG F(c). 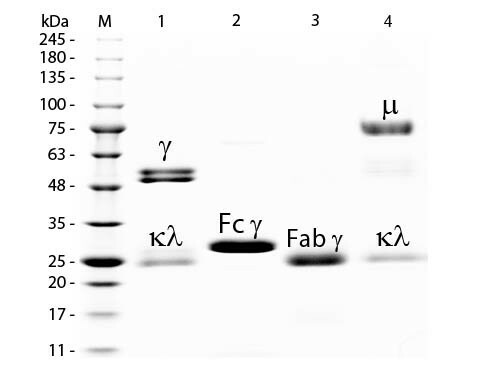 Some light chain cross-reactivity will occur with anti-Rat IgG. Immunoglobulin M is the largest antibody isotype and the first to be secrected against an initial exposure to antigen. IgM is predominantly produced in the spleen. Formed from covalently linking 5 immunoglobulins together, the approixmate molecular weight of IgM is 900kDa and possesses 10 binding sites (though due to the size of most antigens, not all sites are capable of binding at once). Due to this large size, IgM is typically isolated to the serum. Kundenbewertungen für "Rat IgM, whole molecule"